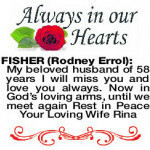 Rodney/Dad/Pop you will be forever missed and always in our hearts. 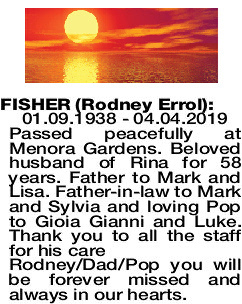 The Funeral Cortege for the late Mr Rodney Fisher of Dianella will assemble at the main entrance of KARRAKATTA Cemetery for a Cremation Service at 12 noon on TUESDAY (9.4.2019). 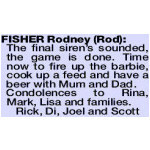 The final siren's sounded, the game is done. Time now to fire up the barbie, cook up a feed and have a beer with Mum and Dad. 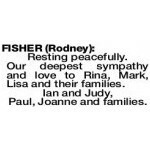 Condolences to Rina, Mark, Lisa and families. Fond memories of my brother-in-law. Gone but not forgotten. Condolences to my sister and families. 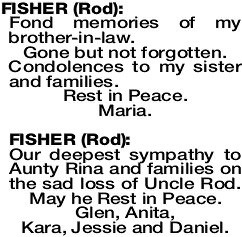 Our deepest sympathy to Aunty Rina and families on the sad loss of Uncle Rod. May he Rest in Peace. Glen, Anita, Kara, Jessie and Daniel. Resting peacefully. Our deepest sympathy and love to Rina, Mark, Lisa and their families. Ian and Judy, Paul, Joanne and families. President Beverley and members of the Lions Club of Stirling wish to extend their sincere condolences to Rina and family on the passing of Rod. 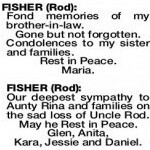 Rod was a member for 37 years, serving 3 years as president and several years on the Dryandra Board. He was awarded life membership by Lions Club International for his committed service.